I harbour no illusions about my family’s eating habits. I know some of them are weird. Take, for example, the fact that when my sons were turning 10, 8, 6, 4, and 2, respectively, we served onigiri at their collective birthday party. Not weird in Japan, admittedly, but we weren’t in Japan. We were in Western New York. And while most of the friends present were pretty psyched to try something new, a couple kids and parents looked at us askew while making sure there was a clear path between them and the door. One poor woman involuntarily threw an onigiri back at the plate and it skittered across the table when she asked what the black stuff was around the rice ball and I responded, “Toasted seaweed!” enthusiastically. Oh well. Can’t convince them all. All of this is to say that since that moment, I’ve been a little more circumspect about what I serve where and to whom. I try to know my audience, so to speak. This works pretty well for the most part. I thought the question would be D.O.A. In fact, I kind of wondered why I even posted the question. Imagine my surprise when I saw that within ten minutes of posting the question, there were already four people who said they’d love the recipe. I think my jaw might’ve slackened a little bit. But that wasn’t where it ended. Within hours, twenty four people had assured me that they, too, wanted the recipe and twenty two other people had liked the status. At that point, my mouth was hanging open so far I looked a bit like a cod. We chat back and forth on facebook, but I can honestly say this was a pretty clear sign that I need to ask you guys more often what you’d like for me to post. Here I’d been withholding one of my favourite staples from you all on the grounds that I was a dork and it was too strange/unique/niche/whatever for you guys when I could’ve just asked all along. Duh, right? Lesson learned. I will now ask. But for the record, y’all are weirdos, too and I like you that way. On bibimbap. This classic Korean dish gets a nice bit of oomph from the sweet and spicy pickled carrots. On sandwiches. Yes. Homemade bánh mì, simple turkey sandwiches, chopped up in egg/chicken/tuna salad, etc… They all taste incredible with these spicy, sweet, tender crisp carrot sticks tucked into them. On salads. Toss a few of these and a fistful of chow mein noodles on a salad before drizzling a nice sesame vinaigrette over top. You’ll be blown away. In summer rolls or spring rolls. These add a mega punch of flavour and texture to summer and spring rolls. Since you all told me you want an Asian style pickled carrot recipe, I’m going to go ahead and assume you like summer and spring rolls, too. See how I get? By themselves. Every now and then I grab a jar of these out of the fridge and a pair of chopsticks and just nibble. Sometimes it’s exactly what I need. In the recipe, I tell you to julienne the carrots (in other words, cut into matchstick size/shaped strips.) If this is too much effort and/or you don’t own a mandoline slicer, you can always use a vegetable peeler to peel thin strips from the carrots. It won’t tuck quite so neatly onto slacker sushi bowls or look quite so polished as the mandoline rendered strips, but it’ll do and it’ll taste every bit as good. Don’t be tempted to leave out the star anise. My husband hates (and I don’t use the word lightly) star anise, but loves what they do here. They give the carrots a certain je ne sais quoi. Just try ’em. 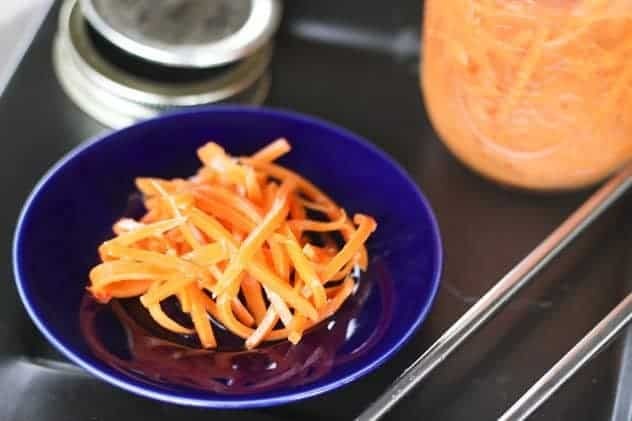 These simple-to-make pickled carrot strips are sweet, spicy, tangy and flavourfully crisp-tender. Put them on sandwiches, bibimbap, sushi rice bowls, relish trays, tuck into salads and springrolls or just snack on them. Once you try them, you'll want to keep lots on hand! In a stainless steel -or other non-reactive pot- combine the vinegars, water, star anise, sugar, crushed red pepper flakes,ginger root, garlic and salt. Bring to a boil, stirring just until the sugar is dissolved. 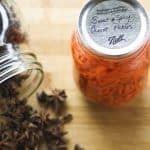 Use a slotted spoon to remove the star anise from the boiling brine and divide them evenly between the jars. Add the carrot sticks to the boiling brine. Bring the liquid back to a boil, about 2 minutes. Turn off the heat. Immediately use tongs or a slotted spoon to divide the carrot sticks between the jars, packing if necessary to fit them all in. Use a ladle to pour the hot brine over the carrot sticks, being sure to cover the carrot sticks with brine. 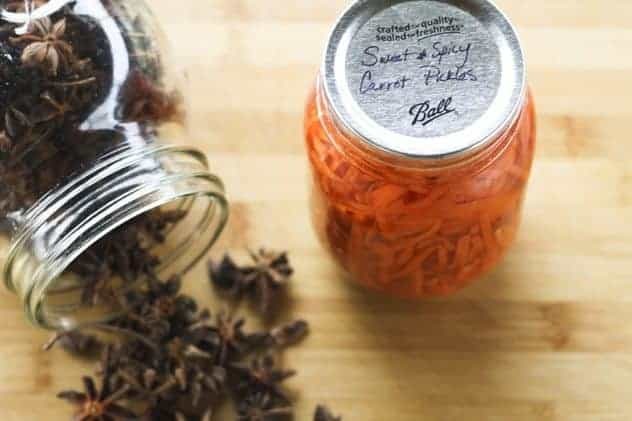 Insert a sterile chopstick or knife into the jars to release air bubbles and add more brine if necessary to keep the carrots covered. Moisten a paper towel with vinegar and wipe the rims of the jars. Position a lid on top of each jar and screw on the rings to finger tip tightness. If you over-tighten, the jars will not process properly. Place the jars on a rack in a canner, add hot tap water to cover the jars by at least an inch and cover the pot. Bring to a full rolling boil and process for 10 minutes. After 10 minutes, turn off the heat, but leave the cover in place and let the jars rest for 5 minutes. After the 5 minutes have passed, carefully transfer the jars to a cooling rack or towel lined counter to cool, undisturbed for 24 hours. Check the seals after 24 hours have passed. If it is a good seal, the center of the jar lid will be slightly sunken in and will not "poing" back up when pressed lightly with the finger. If the lid is domed, or it pops back up when pressed, store in the refrigerator. Wipe down the jars with good seals, remove the rings, and label before storing in a cool, dark place for up to a year. I’m so glad all us weirdos stick together and rejoice when you post a recipe like this! I’m a licorice HATER in the biggest sense of the word, are you sure the anise won’t gross me out? I will have to take your word for this, Beccy…I am another who is not fond of star anise. Maybe it will be like cilantro, a little bit is all right, but the line for too much is not far away. Sweet and Spicy Asian Style Pickled Carrots sounds good. I’ve tried before a papaya pickled and I love it. These look delicious! Thank you for sharing the recipe. Good thing you appreciate Asian foods. We just have different taste and perception towards every thing. That is why, we can’t go along together ALL the time. But there comes some instances that we have to cope with it. I love your idea of knowing who you cook for, so you’ll know what to cook for them. It’s like giving a speech. You should know who your audiences are. To make a perfect speech that would interest them from the start until it ends. Hmm… I have never heard about Sweet and Spicy Asian Style Pickled Carrots and I am sure this is great because it is Asian.. These would be perfect on Bahn Mi – an absolute family favorite! Just don’t like the smell of daikon. How can something so smelly taste so good? I love eating any kind of pickled foods. And these Pickled Carrots sounds good. I’ll add these to my list. I love making Pickled cucumber and it’s more delicious when it has a little of hotness. That is why i’m so excited to try this pickled carrots. Thanks for sharing this! Yeah, I can see this could be really good in a sandwich just as sauerkraut is really good in a sandwich. Thanks for the recipe, it looks really good. BTW- 5 boys? Do they help in the kitchen? I had 3 boys, they did help in the kitchen but less so once they outnumbered me (and were still little). These sound wonderful! I have a friend that I know would love them, but he is diabetic… do you suppose I could sub stevia for the sugar? These look so good. Will be a must to pickle this year. Looks gorgeous, Rebecca! I love this!! It’s the same thing. Happy canning!!! So, I’m all about canning these, but will it work as well if I throw together a pint and refrigerate it, instead of processing them? 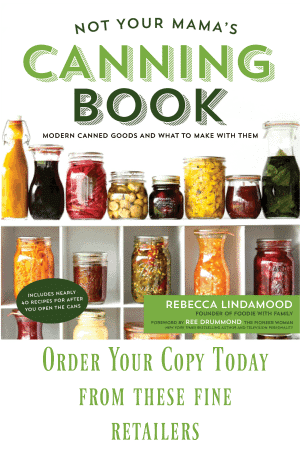 I’d like to make some this weekend but don’t quite have the oomph and time to pull out the canner…..
Oh, absolutely!! And when you realize how much you love them you will want jars upon jars of them in your shelves and can do another batch later. Trader Joes sells bags of julienned carrots for a very affordable price. Making these carrots was a snap! I love them on a salad or in an Asian soup. Thank you for this recipe! I just made a batch of these yesterday. I’m wondering how long they should sit to pickle before I dive-in? Thank you for this recipe! I made a batch yesterday and just wonder how long you let them sit and pickle before eating them. You can dig in immediately! Hooray! I wanted to make something special that I can put away with my last harvest of carrots, and I’m totally going to make these! Thank you for the recipe. We love Korean food, and it’s hard to come by here in rural Maine. Let me start by saying that I fully intend to make the Asian pickled carrots (I love ANYTHING pickled! ), and I thank you VERY much for publishing the recipe, but it will have to be without benefit of whatever flavor star anise imparts. I DESPISE licorice, and anything flavored with it, but I wanted to follow the recipe as written, so I went to a local market where they sell spices in bulk, and bought only the 3 star anise required. I put them into a double-zipper ziploc bag as soon as I got home, but I can still smell that horrible, offensive, permeating licorice odor all over my house 2 days later. They are going out in the trash first thing in the morning, and I will make the carrots without it. Licorice…you either love it or you hate it! I know! I’m married to a guy who HATES licorice and my stepmom also hated it… but I have to tell you that they both LOVED the carrots with the star anise in it! If you can ever stand to make it with the anise, I think you’ll be surprised! I made these to go with the slow cooker Korean tacos and they were amazing! I had a couple friends over, some licorice haters, and they all loved them. I made a third of a batch and didn’t actually can them. They sat for about 8 hours before we dug in and they were perfectly pickled. 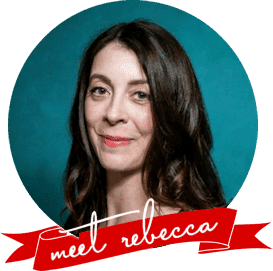 Thanks, Rebecca! You’re so welcome, Lia! I’m glad you loved it. We love to eat these with a fork straight from the jar! I made this with carrots from my garden. First time trying to pickle carrots. They. were. the. bomb! My only regret is I didn’t make more jars. But will definitely make again next spring. These look so delicious! I’ve been looking up Banh Mi recipes and wasn’t sure how I was going to snag myself some pickled carrots. After reading this, looks like i’m making my own! Thanks so much for sharing! the recipe for the sweet and spicy carrots. Fab! Hi Brad- I always hesitate to mess with the vegetable combination because of issues with acidity. As for chopping the carrots more finely, though, I think that’d be okay! Can I use the shredded carrots found in the produce section? If so, how would the timing be impacted. I assume you wouldn’t cook the shredded carrots for the whole two minutes, right? Hi Pam- I have not tested the recipe with the shredded carrots from the produce section, so I’m afraid I can’t tell you whether it would work or how much to adjust the timing. I’m always inclined to use the freshest product possible when canning, so I’d be worried about the age of the pre-shredded ones. Unfortunately, I’m not set up to can them. I am just going to make a small batch as refrigerator pickles. I totally agree with using the freshest vegetables you can especially with canning! Thanks! Do you think cabbage would go well in this recipe? Half cabbage and half carrots? ?